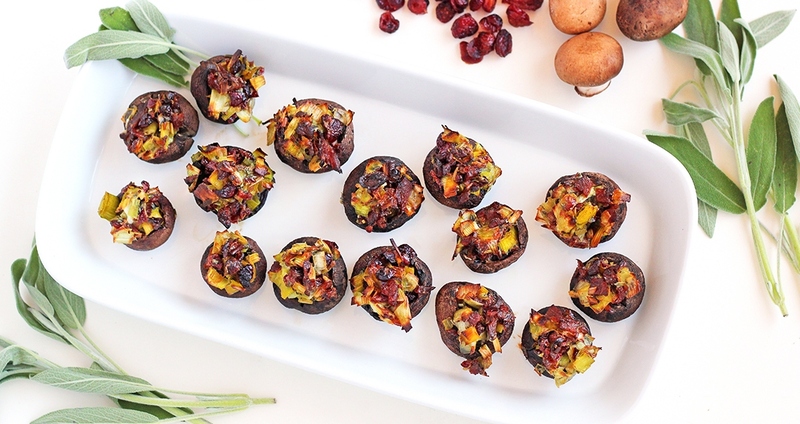 These bacon-and-cranberry stuffed mushrooms are a delicious appetizer for Thanksgiving or any holiday gathering! They are gluten-free and dairy-free, but can be adapted to include ¼ cup of cheese of your choice if desired. Be sure to make two batches if you’re serving a large crowd! Add one tablespoon of coconut oil to a medium skillet over medium heat. Add the leeks, garlic and bacon and sauté for 5 minutes, until leeks are translucent. Transfer mixture to a medium bowl and add the cranberries, sage, egg, salt and pepper. Mix well. Use the remaining tablespoon of coconut oil to grease a baking sheet. Arrange the mushrooms on the sheet and spoon the leek mixture into the mushrooms. Bake for 20 minutes, or until mushrooms are browned. Serve warm.